At Mass this morning, I found myself wistfully wishing that I could be the eighteen-year-old altar server. She is such an intelligent, kind young woman with many talents. Her whole future is ahead of her and she is heading to Harvard in a couple weeks. And, as if that foray into envy wasn’t bad enough (yes, I ALWAYS have to confess envy), I realized that not only am I not young with my future ahead of me, but also that I am old enough to be that young woman’s mother. Do We Allow People to Change? 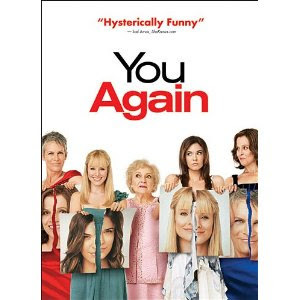 The other night, I had the pleasure of watching “You Again,” a fun, lighthearted comedy that will appeal to anyone who ever found herself at the bottom of the social ladder in high school. Featuring such stars as Jamie Lee Curtis, Sigourney Weaver, Kristen Bell, and Betty White, it explores what happens when women are forced to come face to face with the women who made their lives horrible in high school. They are compelled (after considerable conflict) to come to terms with the fact that these women are not who they once were. They had changed and grown. Is the person we are at seventeen, or twenty-five, or forty the person we are destined to be forever? Is it possible to change in any fundamental way? Will people who knew us at a certain moment in our lives ever be able to see us in a different light? These are all questions worth pondering. I know that I have changed over the years. Certainly, some aspects of my personality have stayed constant, but there are things that I have said and done in my past and beliefs that I have held that now make me cringe. Life experience, education, and the influence of others have altered my way of thinking. I also realize that I am still a work in progress. How I feel and think in twenty years (presuming I am still on this earth) will no doubt be different than how I feel and think today. I hope that other people will be able to accept me as who I am at any given moment in my life, and not judge me by who I was several years earlier. By the same token, I hope that I am able to extend the same courtesy to others. I admit that it can be difficult. It can be easier to hold onto old hurts and old impressions. It takes courage and maturity to let go, forgive, and accept people as they are today. One of my pet peeves in life is when people are running for public office and some member of the press pulls an article they wrote or a statement that they made when they were younger stating a given position that is contrary to a position that they now hold. Such evidence is usually used to show “flip-flopping” or a lack of strong conviction. I see it as evidence that a person grew and changed and is capable of changing his or her mind. St. Paul was arguably the person who changed the most in Scriptural history. As Saul, he was the chief persecutor of Christians. After his encounter with Christ on the road to Damascus, he became one of Christianity’s greatest proponents. It would have been easy for Christians to regard him with suspicion. Indeed, some did. But, his life illustrates that people can change in dramatic ways. What would have happened if no one believed that such change was possible? Lent is meant to be a time of growth and change. Hopefully, Easter will find us different people than we are today. We want others to accept and love us for the person we are becoming. Do we allow other people to change as well or do we judge them by who they once were? 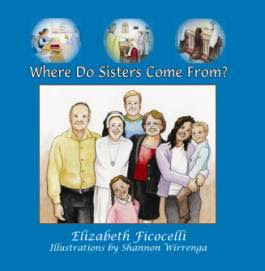 “Where Do Sisters Come From?” by Elizabeth Ficocelli is the perfect introduction to women’s consecrated religious life for children. In an era where Catholic children may be exposed to relatively few sisters, their way of life may seem very mysterious indeed. Who are these sisters and what is their life like? “Where Do Sisters Come From?” answers these questions with honesty and beauty. While this book is written for girls to encourage them to consider the possibility that they might be called by God to this way of life, it is important to note that it is equally informative for boys. Ficocelli begins by describing the process of discernment. What does it mean to hear God’s call and to respond to it? She discusses the importance of prayer and finding the right religious community. The three vows a sister takes are defined, as is the habit many sisters wear. “Where Do Sisters Come From?” is a wonderful book to share with your children or grandchildren. It would also make a great addition to a parish religious education program or library. It is a magnificent vocations tool. Many Catholic women are ignorant of the Jewish roots of our faith and the rich tradition that we share with our Jewish brothers and sisters. 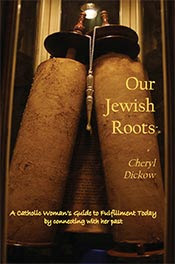 Cheryl Dickow seeks to correct that with “Our Jewish Roots: A Catholic Woman’s Guide to Fulfillment Today by Connecting with her Past.” The book is divided into two parts. The first focuses on “Traditions, Teachings, and Truths Rooted in the Jewish Faith.” This section makes for fascinating reading. Topics such as marriage vows, baptismal waters, the role of angels, the importance of good deeds, the power of prayerful intercession, mysticism, and holy feasts are explored from the perspective of their Jewish beginnings. These pages help one realize just how much we do share with our Jewish brethren and how much we Catholics owe to their traditions. The second portion of the book centers on “Role Models for Today’s Catholic Women.” This is where Dickow truly shines. She begins by discussing a woman’s worth, not our worth as the world often chooses to measure it, but our worth in the eyes of God. “From Eve to Sarah to Deborah to Mary, Scripture assures every woman who has ever lived that her life is both special and valuable. Her life has a purpose and a meaning set by God and necessary to His plan for humankind. Each and every one of us came here with an extraordinary set of gifts and a particular set of circumstances. Our births were the intentional acts of an affectionate, devoted God whose love for us is truly immeasurable. We are as unique and varied as stars in the sky. Our gifts and talents are limitless – even if they sometimes feel non-existent or without value.” Dickow defines true feminism as support of a woman’s vocation, whatever God may have called that particular woman to be. 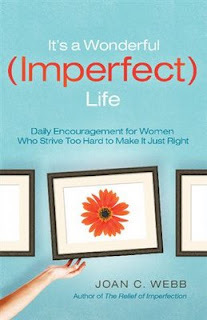 She then goes on to explore the lives of several women from Scripture to illustrate that there is a role model for each one of us. These women come to life through Dickow’s words and reflections. One will rediscover well-known women such as Sarah, Rebekah, and Rachel, and will perhaps become acquainted for the first time with less famous, but no less important, women such as Lot’s wife, Zipporah, Shiphrah and Puah. Each of these women that Dickow profiles has something to teach us, if we only take the time to reflect on their stories. “Our Jewish Roots” has much to offer to modern Catholic women struggling with where they fit in God’s big plan. By knowing our history, we can better understand ourselves, our own faith, and the dignity which God has bestowed on women throughout the ages. We women are awfully harsh in the self-evaluation of our bodies. There is always something to be improved, some flaw to be corrected. Even beautiful movie stars aren’t immune to this criticism – just look at how many get plastic surgery or criticize their own appearance in public. There is this obsession with youth, that if you don’t look twenty-one, you have ceased to have value to society. I totally disagree that at the age of thirty, or forty, or eighty, for that matter, we stop being beautiful. I think that there is a self-assurance that comes with getting older. My friends and I are all in our thirties and early forties. I think that many of them are more attractive now than when they were younger. Yes, youth has a vitality and a beauty all its own, but a woman gains a special something as she becomes more comfortable in her skin. There is a glow that comes from the inside, a self-confidence that radiates. There is a joy that comes from leaving the awkwardness of adolescence and young adulthood behind and becoming a mature woman. There is a beauty in caring more about what you can bring to the world than in caring about what people think when they look at you. God gave us these bodies and he made them so that they would age. I accept that aging is part of the process of living. Yes, I no longer look eighteen. I have laugh lines and a few grey hairs (getting more every day!). Motherhood changed my body. Time will continue to change it. When I look in the mirror, I certainly notice the changes, but they don’t define me. All women are beautiful, no matter what their age. True beauty comes from the inside and the wisdom and increased capacity to love that comes with age only enhances that.